I know Valentine’s Day was 10 days back. But it’s still spring out here. And I have only now got around to making one of the cutest recipes that came my way around valentine’s. 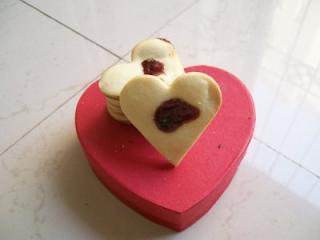 Sweetheart cookies look too good to eat, and are fun to bake. Beat 60 gm softened butter and 30 gm caster sugar until smooth. Then add ½ tbsp vanilla extract and 100 gm flour. Knead into a dough, roll it out and cut into heart shapes.